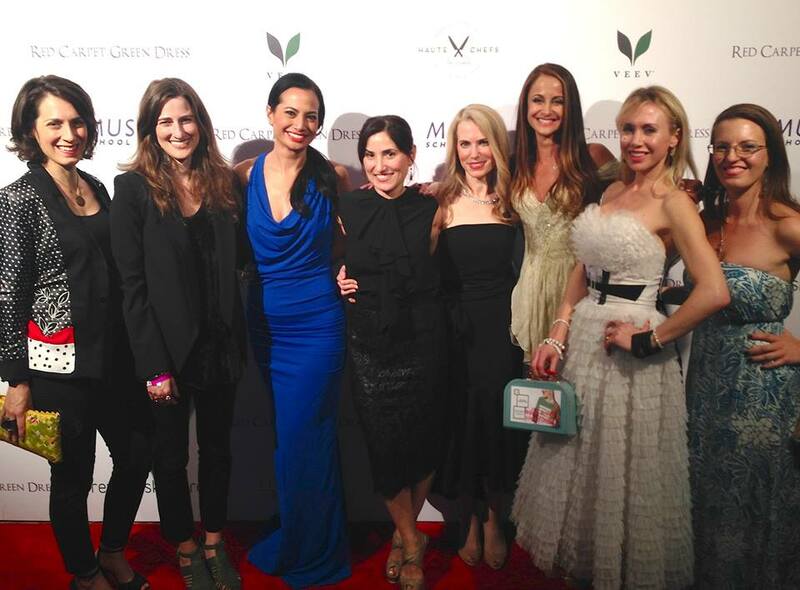 “Made in China”, “Made in Bangladesh”, “Made in the USA”, “Made in Mexico”… so many faces behind the seams. Have you ever wondered who those faces might be? 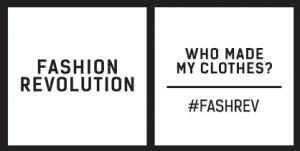 Fashion Revolution is a global campaign asking that very question: ‘who made my clothes?’ in order to initiate human connections throughout the supply chain. As an upcycle designer who uses pre-existing clothing, I am very familiar with other manufacturer’s clothing tags. I become most familiar with the names of brands that design for big chains like Old Navy, Kohl’s, Macy’s, ect. Why? Because these brands are constantly pumping out new collections and malls exists across the United States. Single serving clothing. Then they end up at the thrift store and this is where I have become familiar with these clothing tags. A lot of this clothing finds a second serving (adopted by a new owner), some of it is shipped to another country, more of it is thrown away, and a few just sit there- like puppies in a window- waiting and waiting for someone to come along and give it a purpose again. It sits there confused thinking, “But so much time and energy went into creating me. I was cotton blowing in the wind, I was fiber being spun, I was a multitude of hands who put me together. Why don’t you appreciate my beauty beyond the trend?”. I’ve always cared about these social cast-aways and when I revive them, I cut out their tag and save them- a remembrance of what they were. Over the past 8 years, I have amassed quite the memorial. 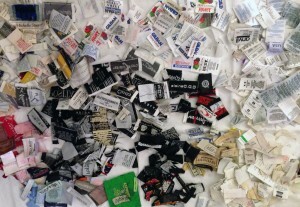 Fashion Revolution Day gave me the inspiration to use these clothing tags as material within a design. With awards season approaching in L.A., I wanted to create 2 gowns that could be worn to Red Carpet events that displayed this social message. The trick for me was to use the tags without having them over power the dress and thus the individual wearing it. Here is a bit about how they were created. The 1st dress began as a black cocktail dress made by Cache and purchased at a consignment boutique. I did not want to alter the construction of the dress as it fit well and did not need altering. This leaves a blank canvas to design on. Thus, the hard part becomes creating that design and it took weeks of playing around with different patterns and directions. I was drawn to the clothing tags that had the specific name of the designer and were embroidered. I didn’t want to call out anyone in particular and I felt that if I left their names visible it would distract from the overall message. So I flipped them over and once I did that, it all fell into place. They needed to be secured around the edges, so I used iron-on bias tape in black and white. 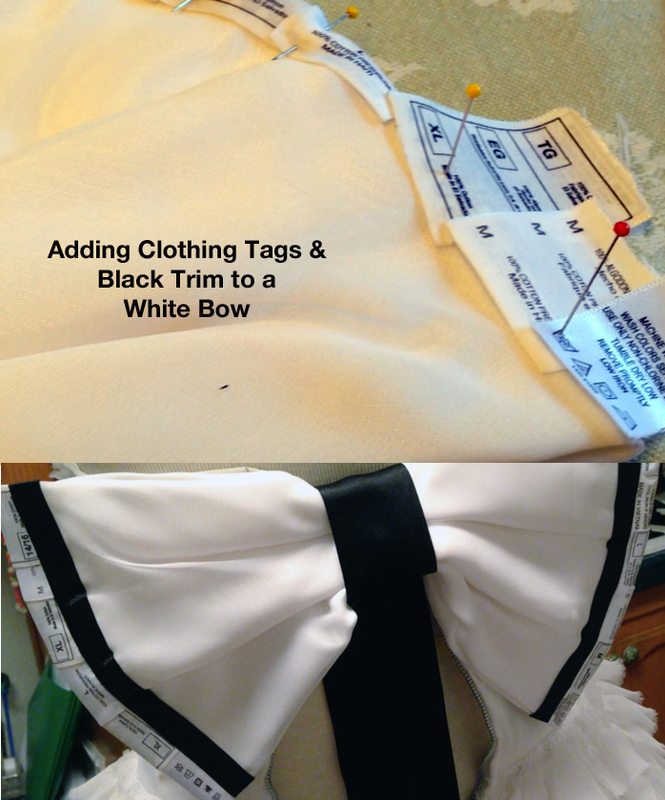 I followed the design around the shoulders into the back with finishing details on the bow. My last element was to add a clothing tag from (RE) on the center front to answer the Q with a ‘Yes, I do know where my clothing comes from’ but mainly because it added to the color scheme. The 2nd dress naturally evoked the spirit of the clothing tag, as it’s original construction of white frills resembled that of a field of tags. 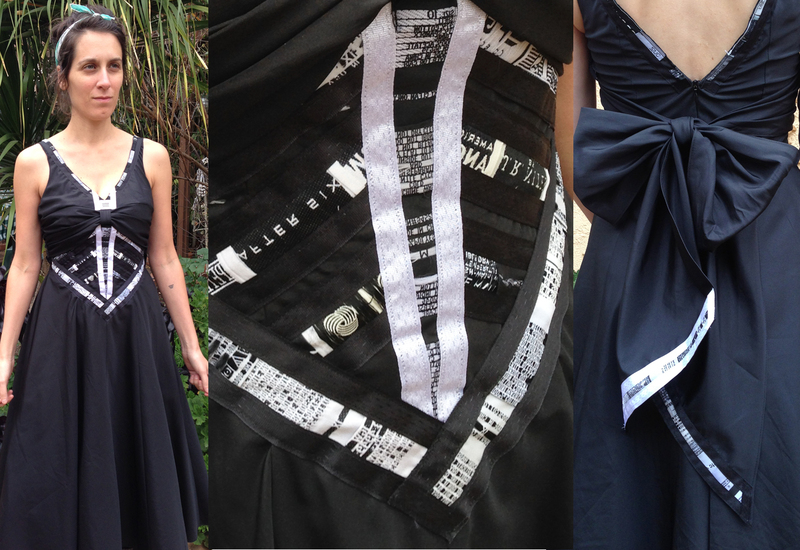 Made from a 1950s dress, I took apart and completely reworked the waistband. The black front lines were made from a black shirt collar and the back bow was made from a salvaged white bow + black straps from another dress. 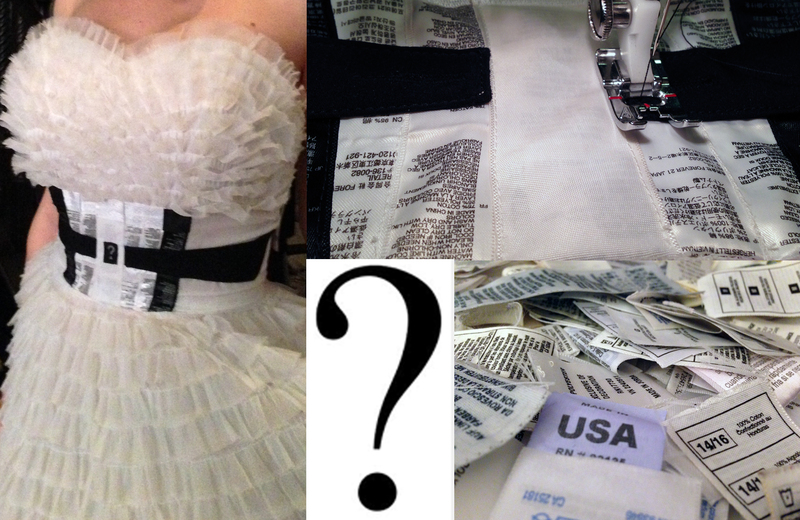 For this dress, I used clothing tags that had the manufacturer’s instructions oh how to care for it and where it was made. You know, those big long ones that we cut out because they ‘get in the way’. The last element that really brings this dress together is the front question mark, which I took off of my Guess jeans. This literally asks, “?… Who makes your clothes?”.